Bude is consistently voted as the UK’s Best Coastal Town at the British Travel Awards year-upon-year, but it’s not just our facilities which get us top marks. The combination of crystal clear waters, golden sands and green spaces also contribute, and we’re pleased to be recognised as such an environmentally conscious town. One of the things Bude is most famous for is its beaches. Our award-winning coastal town is lucky to host multiple beaches along the Atlantic coastline; and three of them have been given internationally recognised awards, showcasing a high quality environment which regularly attracts families and keen water sport enthusiasts. Widemouth Bay, Summerleaze Beach and Crooklets Beach all hold a Seaside Award, with Widemouth Bay also winning a coveted Blue Flag, one of only seven in Cornwall. Criteria to meet these awards is based on elements such as good water quality, availability of educational information about the beach environment, and facilities such as public toilets and lifeguards – proving Bude is a fun and safe environment for a seaside holiday. But maintaining these high quality beaches can be hard work. Bude has a very active community which cares about the environment, and even its very own environmental group, A Greener Bude, which works hard to ensure Bude is as sustainable and environmentally-friendly as possible. Under this group there are many people working together towards a common goal of improving marine and environmental pollution, climate change and the economy and health of Bude’s community. Initiatives throughout the town include beach cleans and a cleaner seas project, helping to maintain the high quality beaches and bathing spots which are arguably the town’s biggest attractions; a biodiversity trail, which works on the conservation of plants and wildlife; and a big push on reusing and refilling products, minimising the need for single-use plastic and waste. Want to get involved? Join a tribe of likeminded individuals on the first Saturday of every month at Crooklets Beach for a beach clean, taking place from 10am until 12pm with all equipment provided. After all your hard work, why not join us at The Beach for some refreshments? Warm up in winter with a rich hot chocolate, or sip one of our signature cocktails in the sunshine on our terrace. For something a little more substantial, our lunchtime offer of two courses for £15 or three for £18 is a great way to reward yourself for helping to keep our town clean and tidy. 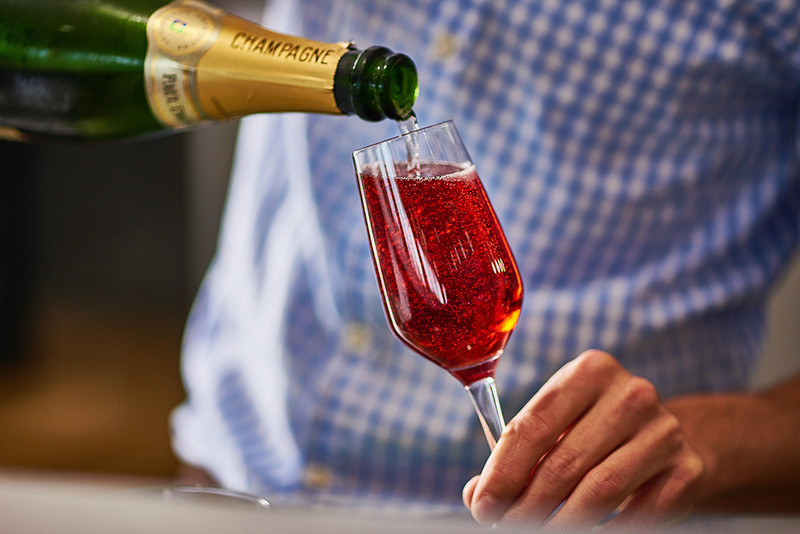 Celebrate Mother’s Day with us on Sunday 31 March with two courses for £18.50 and three courses for £22.50. Mum will also receive a glass of Prosecco on arrival. A family favourite; often a time when all generations come together around the dinner table and enjoy a hearty meal whilst catching up on the week’s events. Cooking a delicious Sunday roast can be quite an accomplishment, and thanks to our head chef Jamie Coleman, we’ve outlined the top tips to make sure each element of the plate is cooked to perfection. Whether you fancy beef, pork or lamb for the main event, we’ve got Jamie’s advice on the best cuts of meat for roasting. For beef lovers, it has to be a slow-roasted sirloin, seasoned heavily with salt, pepper and rapeseed oil before placing in the oven. Cook at 230 degrees for 15 minutes, then turn the oven down to 160 degrees and cook for 30 minutes. You must allow the meat to rest for an hour once taken out of the oven covered in foil, so when you carve you should have perfectly pink beef. It’s great served with horseradish cream. If you prefer lamb, the best is a pot-roasted shoulder, boned and rolled (any butcher can do this for you) then stud with garlic cloves, rosemary and anchovies. Seal off in a casserole dish, then add chunky chopped carrots, onions and parsnips. Lid the dish and cook in oven at 160 degrees for approximately four hours, until it’s tender and pulls apart. Finish with grated lemon zest. Last but certainly not least, if pork is your favourite meat then it has to be slow-cooked belly. Tie the pork belly into a round shape, then pour boiling hot water over the skin three times and dust with table salt. Put in the oven at 230 degrees for 40 minutes until the crackling starts to crisp, then turn the oven down to 160 degrees and cook for three to four hours. Carve and serve with baked apple sauce. Jamie suggests one of the best vegetarian alternatives for a roast dinner is his recipe for a baked carrot baklava. Made using a combination of ingredients including carrots, pine nuts, spinach, mushrooms, kataifi pastry and Cornish Smuggler cheese – this crunchy, flaky dish is great served with sour cream and chives. Slowly braise the carrots in orange juice until tender, then sweat down the spinach and mushrooms with garlic. Add pine nuts, crumble in the cheese and allow to cool. Lay the spinach mix flat on cling film and place the carrots on top. Roll the cling film up and allow to set in fridge for an hour. Once set, unroll the cling film and wrap the kataifi pastry around the mix. Place on a backing tray and cook in the oven at 200 degrees until golden and crispy. To make the perfect roast potato, Jamie recommends pre-blanching potatoes in salted water with garlic, thyme and lemon. Strain off the water and allow to air dry. Whilst the potatoes are drying, place a roasting tray in the oven at 200 degrees with duck or goose fat. When the potatoes are cool, squish them slightly to open them up. After the tray has been in the oven for 15 minutes add the potatoes and cover coat with the fat. Be careful, this will be very hot. Roast in the oven for 45 minutes until the potatoes are crispy, then add garlic and thyme and cook for a further 10 minutes. Light and fluffy with a crispy outer; Jamie’s recipe for the perfect Yorkshire pudding is: one cup of plain flour, a cup of milk, four eggs, and two tablespoons of white wine vinegar. Heat a muffin tray in the oven for 10 minutes with a small amount of oil in each section, then pour the batter evenly throughout the holes. Cook at 190 degrees for 35 minutes. Vegetable accompaniments are often a personal choice depending on the tastes and preferences of your family. Our personal favourites to serve in the restaurant are cauliflower cheese, carrots and broccoli. 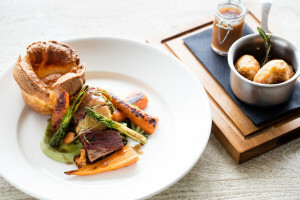 Alternatively if you don’t want to cook at home, The Beach serves a delicious roast every Sunday from 12-8pm. To book a table call 01288 389800. 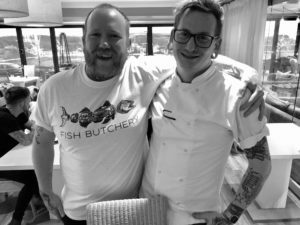 We are extremely excited to be welcoming Port Gaverne’s Josh Donachie to Bude to prepare a delicious tasting menu alongside Jamie Coleman on Friday 1 March. 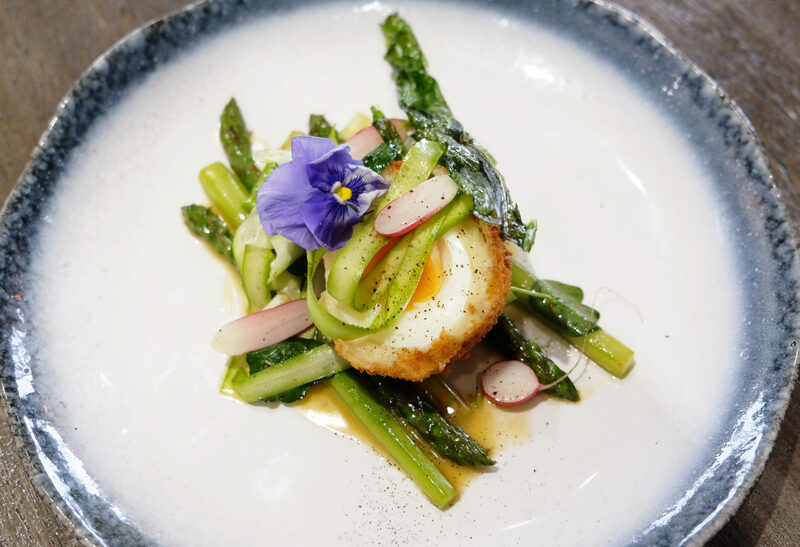 Trained in fine-dining, Josh describes his style as modern-British with Nordic, Australian and Asian influences. He is most proud of a dish he created when working with Adam Handling at the Frog – chocolate mousse made using tofu, a vegan-friendly dessert which can still be found on the menu two years on. Josh and Jamie first met in 2015 on the BBC TV series, MasterChef The Professionals. Since then they have competed alongside each other at the British Culinary Federation’s chef of the year finals, and kept in regular contact through social media. Commenting on the collaboration, Josh said, “Jamie and I have similar styles of cooking, but we’re also very different and take influence from a variety of cuisines. We had spoken about collaborating for a while. A lot of people do pop-ups, it’s a nice way of seeing what others in the industry are doing, and I’m really looking forward to the evening. For more information or to book a table, call our friendly team on 01288 389800. We’re also offering a weekend stay package including the wine tasting dinner, find out more here. Bude was voted the ‘Best UK Coastal Town’ at the British Travel Awards at the end of 2018 – an accolade it also achieved in 2016 and 2017. 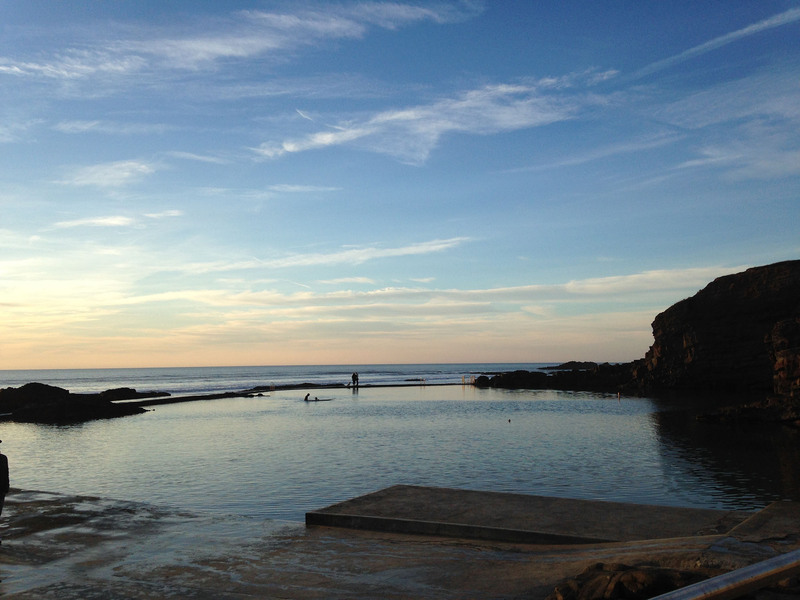 Known to be Bude’s number one attraction, the Bude Sea Pool is free to use all year round and provides a safe swimming area for those that may find the swell from the sea waves too daunting. This semi-natural pool is 91m long by 45m wide and was created in 1930s. Managed by the Friends of Bude Sea Pool charity, it welcomes around 50,000 visitors every year. Whether you’re into walking, cycling, kayaking, fishing or taking it easy on a peddlo – the Bude Canal is a hub of activity for all paces of life. The two mile footpath alongside the canal and marshlands is perfect for admiring the vast array of wildlife, so there’s plenty to see and do for the whole family on a day out. Bikes, kayaks and peddlos are all available to hire in Bude, making it easy to explore without bringing a car load on holiday with you. Well known for seaside holidays in Cornwall, Bude has two main beaches, Summerleaze and Crooklets, which are great for building sandcastles, surfing and many other watersports. The South West Coast Path also passes through these beaches, perfect for winter walks when the icy water and sunbathing on the golden sand isn’t so inviting. Perched on the sand dunes overlooking Summerleaze Beach is the Grade II listed castle, home to three galleries showcasing work of local artists including art, pottery and photography. There is also a Heritage Centre where you can discover Bude’s rich history, with exhibitions and artefacts from a variety of collections, such as the Bude railway. Admission to the castle is free, providing a cultural and educational activity for all generations to enjoy. Not your typical tourist attraction, but the Bude Tunnel has become somewhat of a famous landmark in our coastal town. With five-star reviews and comments including ‘a tunnel like no other’, the 70m long tunnel which stretches from Sainsbury’s car park all the way to Crooklets Road is definitely worth a visit. Providing undercover protection from all weathers (always a bonus in Cornwall where the weather can be a little unpredictable sometimes), it’s no wonder why the public take cover here to enjoy the spectacular sea views in Bude. A unique asset to the town. UK staycations aren’t just enjoyed by humans. If you’re a dog owner then it is often hard to leave your four-legged friends at home. 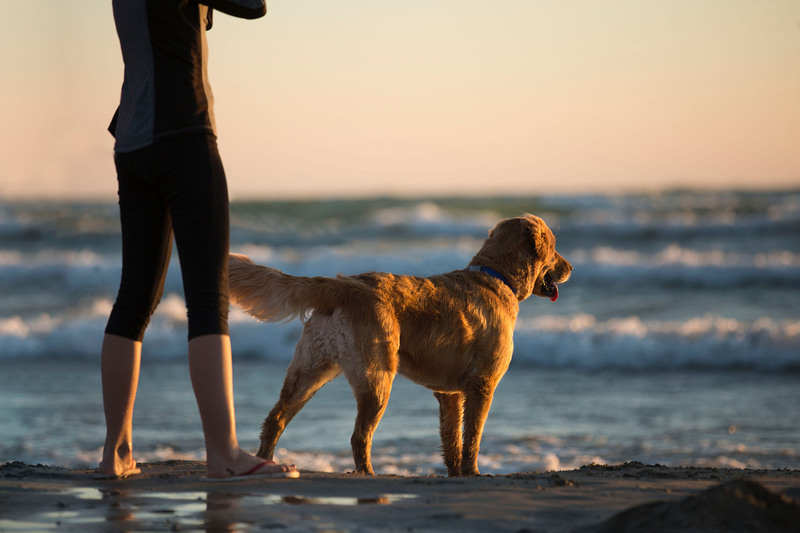 Due to popular demand, we are pleased to provide our first dog-friendly accommodation offering in one of the newly-finished suites, with tiled flooring throughout making it perfect for clearing up sandy paw prints. The Retreat benefits from two bedrooms which can both be made up as doubles or twins (perfect for families or a group of friends travelling together), a family sized bathroom and a large well appointed kitchen-diner and lounge. Our terrace also welcomes dogs all year round, so even if you’re not staying with us in the hotel you can join us for a drink and bite to eat after your dog walk. Bude boasts a variety of footpaths and trails perfect for dog walking. 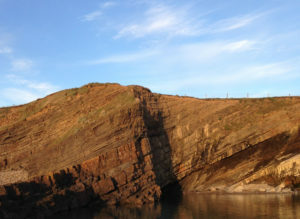 From the leisurely two-mile stretch of flat tarmac path along the Bude canal, to the rugged South West Coast Path connecting Bude to nearby beaches such as Crackington Haven to the south and Marsland Mouth to the north. For culture seekers wanting to find out a little more about Bude’s history, the four-mile circular town trail is also a nice route to be accompanied by your dog. With so many beaches in the Bude area, it’s always useful to know when and where dogs are allowed at certain times of the year. Sandymouth, Northcott Mouth and Black Rock beaches are dog-friendly all year round with no restrictions. The only restriction on Summerleaze Beach is that dogs must be on leads between 21 May and 30 September. 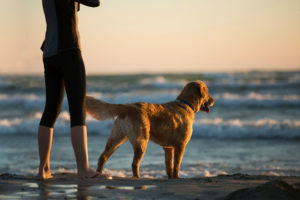 Finally, Widemouth Bay and Crooklets Beach only allows dogs on the beach between 1 October and 31 March. Book your next stay at The Beach at Bude online, or call our reservation team on 01288 389800 to discuss your requirements. 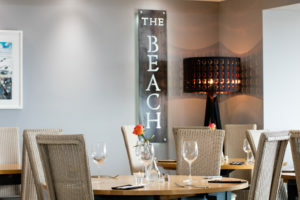 The Beach at Bude offers a romantic setting for couples wanting to celebrate Valentine’s Day in style, overlooking Summerleaze Beach in north Cornwall. Find an example menu from Valentine’s Day 2019 below, and keep an eye on this page for updates on our 2020 romantic offering. The main event in the Bude Christmas calendar is the annual Christmas Day swim. Hosted by Bude Surf Life Saving Club, over 500 people brave the icy cold waters to take part each year in the ‘no wetsuits’ swim, which has been running for around 35 years to raise money in memory of former member Mike Moyle. Taking place at Crooklets beach, crowds of swimmers plunge into the Atlantic Ocean on the north Cornish coast – whatever the weather. 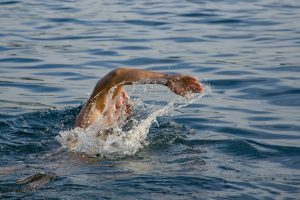 Many spectators come to join in the festivities, supporting the adventurous (and some may say mad) participants with cheers of encouragement and warming towels to welcome them out of the water. Hot chocolates and refreshments are supplied after the event which creates a lovely community atmosphere where swimmers and spectators come together to share Christmas wishes and photo opportunities. 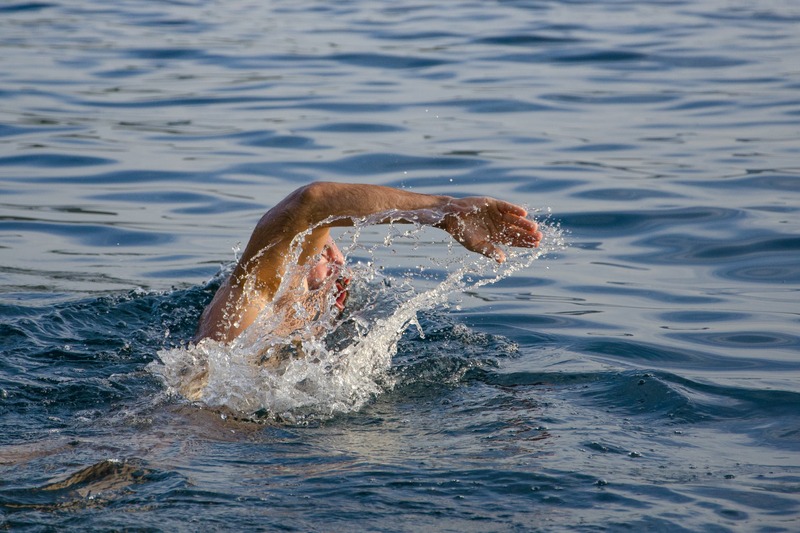 If you want to take part in this year’s swim then visit the SLSC website for a registration form – or if spectating is more your style then head to the shoreline for an 11am start on Christmas morning.